2015 marks the 125th anniversary of Ericsson supplying telecommunications equipment in Australia. The history of Ericsson in Australia is pr?cised here and the paper entitled ?Establishing L M Ericsson Crossbar Production in Australia? is included for historic reference. Ericsson began sales in Australia in 1890 through its agent C A Fahlstedt in Sydney. Initially, sales consisted exclusively of telephones and spare parts for telephones, not telephone exchanges. In the 1890?s Ericsson was a key supplier of Magneto telephone equipment and Coffee Grinder & Biscuit Barrel models appeared in Australian?s homes and businesses in 1890s. Ericsson magneto phones were praised in rural and regional areas for their operational reliability. Australia and New Zealand became one of Ericsson's largest markets outside Europe. In fact, in 1900, sales in Australia were greater than in Sweden. In 1902, Ericsson's senior engineer Hemming Johansson, who would subsequently become president of the company, travelled to Australia and South Africa, which was also a major market. Johansson wanted to demonstrate the company's technical expertise and had brought with him a small switchboard with a central battery system. Hemming Johansson later wrote about the visit as follows. "Through a stroke of luck, leading engineers from various telephone companies were attending a conference in Sydney during my visit. An offer to arrange a practical demonstration of the latest equipment and discuss technical matters with these gentlemen was readily accepted". In conjunction with Johansson's trip, Fahlstedt was replaced in Sydney by the Scottish businessman James Paton. Ericsson also recruited agents in other parts of the country and sales were expanded to include switches. The Australian Post Office (APO), later called Telecom Australia, then AOTC, then finally Telstra, soon began replacing the manual switching system with the automatic Strowger system, and other suppliers took over the market, even with respect to telephones. Ericsson's telephones were renowned for their high quality and sales continued to be sufficiently successful to enable James Paton to establish a sales company in Australia in the early 1920s called the Ericsson Telephone Manufacturing Company. Australia did not emerge as a major market until after James Paton's death in 1949. The new manager for the Australian market was an Australian named Les Rowe, who established a new Ericsson sales company called L M Ericsson Telephone Co. Pty Ltd (ETA) for the sale of switching systems. He faced a tough challenge as the APO had already signed an extensive multi-year contract with two British companies, Standard Telephones & Cables (STC) and Telephone & Electrical Industries (TEI), for delivery of telephone exchanges. When the expansion of the telephone network began after World War II, the Strowger system was considered limited and outdated. Les Rowe thus saw his chance and presented a small demonstration version of the crossbar switch to the APO?s Director General and followed up on this by submitting an offer. At the time, however, the Director General was not receptive. Rowe stubbornly continued his efforts to influence the APO and took every opportunity to praise the advantages of the crossbar system. When these efforts did not succeed, in 1953 he donated a 60-line crossbar switch to the APO for use in its laboratories. The APO's engineers were extremely impressed by the crossbar switch and in January 1954 ordered an additional 60 lines to be added to the switch that Rowe had donated. In July 1954 the APO ordered two 600-line exchanges, one for Sydney and one for Melbourne. In late 1956, with growth in demand for telecommunications, the APO established the Automatic Network and Switching Objectives (ANSO) Committee to investigate options for a new Subscriber Trunk Dialling (STD) telephone system for Australia. The committee undertook extensive studies of various telephone systems, and through laboratory experiments came to the conclusion that Ericsson?s crossbar switches were at the time superior to those produced by its competitors, which included International Telephone & Telegraph (ITT - the ultimate parent of STC) and Siemens. 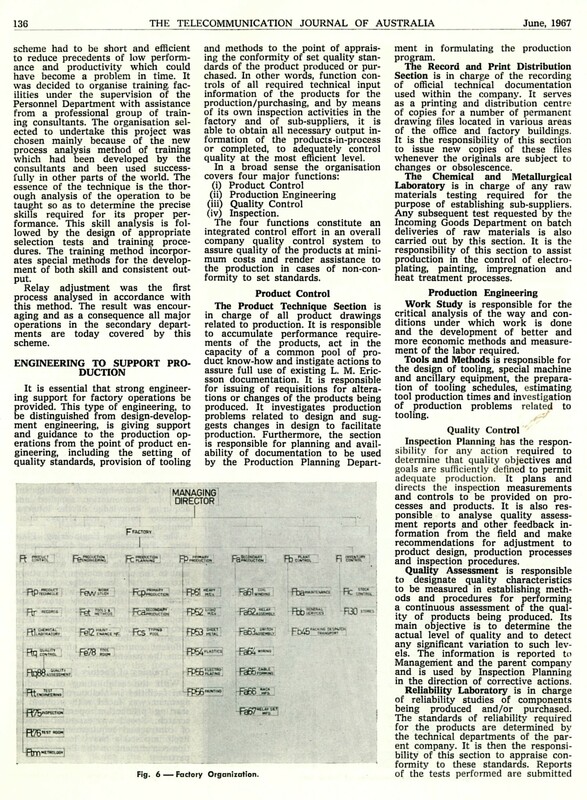 The APO was now seriously considering abandoning the Strowger system, and in 1959 chose the Ericsson crossbar system for the Australian telephone network, thanks mainly to their flexibility for small, medium and large exchanges. Ericsson was selected to provide a 6,300 line crossbar exchange to be located in Toowoomba, and the system was delivered in 1960. Initially, the Ericsson crossbar switches were manufactured under licence by STC and TEI in Australia, but Ericsson believed that there was room for another manufacturer. In 1960, the company purchased Trimax Transformers Pty Ltd, which was renamed L M Ericsson Pty Ltd (Ericsson Australia) in 1963. After this acquisition, the company's production was converted to telecom equipment. 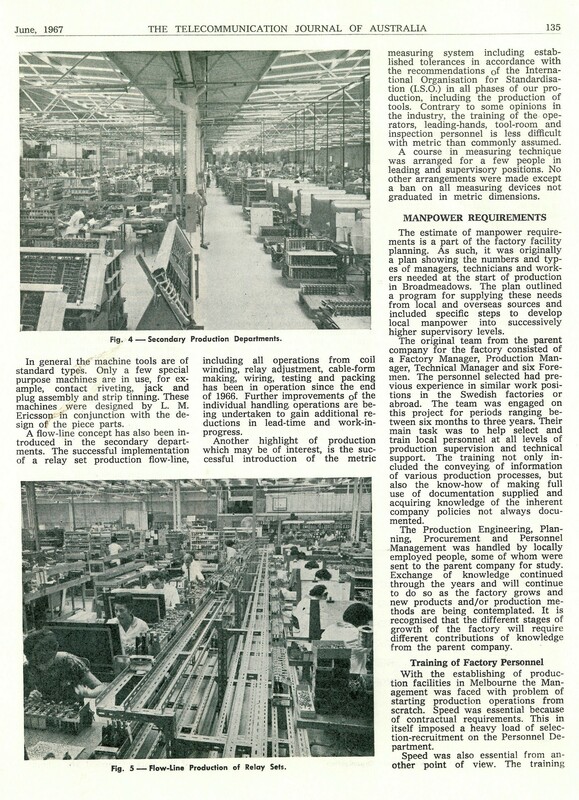 Soon after, a new production plant was built at Broadmeadows in Victoria (the subject of the following historic paper). When STC's and TEI's licences expired in 1963, they were not renewed by the APO. Instead, manufacturing was awarded according to a bidding procedure which resulted in Ericsson capturing one third of the market for public telephone exchanges in Australia. By the middle of the 1960?s, Ericsson was experimenting with Stored Program Control (SPC) which was initially devised at Bell Telephone Laboratories. It was evident that electronic SPC exchanges were the way of the future, and Ericsson and Televerket (the Swedish PTT) decided to combine their research efforts to commercialise a digital switching product. Therefore in 1970, Ericsson and Televerket formed a joint development company called ELLEMTEL. The new product was designated AXE, and featured the decentralisation of the processor functions to enable the modular construction of large and small exchanges. Australia was one of the first countries to purchase the AXE with an order from the APO in 1977. The first generation SPC exchanges were hybrid electro-mechanical switching under SPC control (AKE and ARE). The first generation of AXE were also hybrid using reed relays for switching. With the advent of Pulse Code Modulation (PCM), the system was enhanced with a digital group stage largely developed by Ericsson Australia. Ericsson Australia also played an important collaborative role with the APO to optimise the AXE to the unique requirements of the Australian telecommunications environment. Australia has long collaborated with strategic partners to develop solutions tailored to local needs. This Journal contains many technical papers describing where Ericsson and the APO have worked together to adapt the AXE platform to meet real-life technical challenges. The next significant technological innovation spearheaded by Ericsson (and others) was the development of the cellular mobile telephone system and the introduction of the CCS7 signalling system. Mobiles continue to have a dramatic impact on world-wide communications today. Space does not permit me to detail the numerous technological and regulatory advances throughout the world during the 1970?s and 1980?s, except to say that Ericsson emerged in the 1990?s as one of the dominant suppliers of mobile telephony, utilising the AMPS and GSM standards. In the mid-1980s, Ericsson Australia was awarded the contract for a nationwide Advanced Mobile Phone System (AMPS ? American 1st generation mobile standard) from Telecom Australia. This was followed in the early 1990s by an order for a Global System for Mobile communications system (GSM ? European 2nd generation mobile standard). In 1992 Telecom Australia and the Overseas Telecommunications Commission were merged into the Australian and Overseas Telecommunications Corporation (AOTC), renamed Telstra Corporation in 1993. The subsequent privatisation of Telstra, and the introduction of network competition in Australia, provided Ericsson with the opportunity to supply equipment and services to several new carriers, including Vodafone, Optus and Hutchison. Ericsson has continued the development of mobile broadband and was a major contributor to the international standardisation of 3rd Generation (3G wideband CDMA) and 4th generation (4G Long Term Evolution LTE) mobile systems. At the present time, Ericsson Australia has been awarded significant contracts in Australia for wideband CDMA and LTE, as well as the related packet data nodes and cloud services. The evolution path to 5th generation (5G) mobile services is referred to as the ?Internet of Things?, providing broadband everywhere, anytime. 5G standardisation is being driven by the significant increase in mobile data volumes, throughput and the number of connected devices. 5G will also provide improvements in battery life and lower latency for critical control of real time systems (for example smart vehicles). In 2015, Ericsson celebrated its 125th year of supplying telecommunications equipment in Australia. Ericsson Australia has delivered Australia?s 1G, 2G, 3G and 4G mobile networks and is now collaborating on 5G. This is a significant milestone considering the technological changes that Ericsson has successfully innovated for well over a century in this country. This history was pr?cised from the historical content on the Ericsson global website: "The History of Ericsson ? Australia" (Wickman nd). 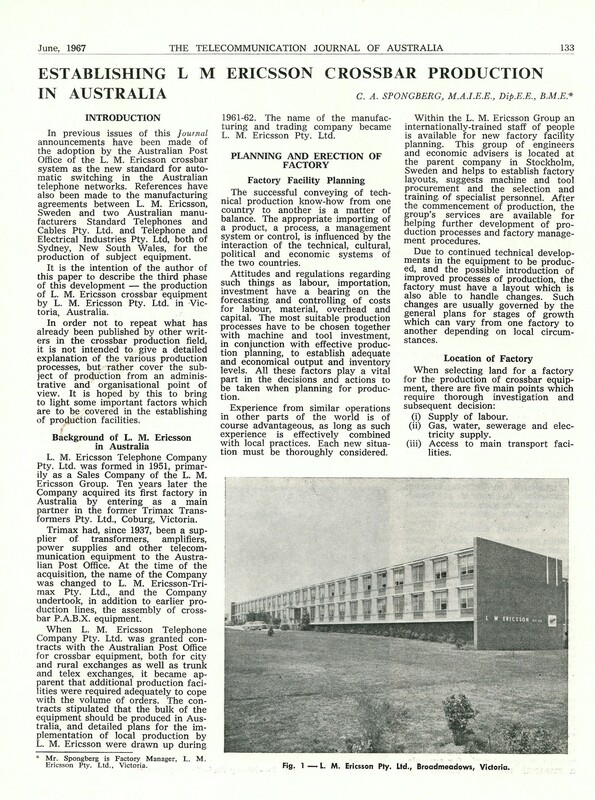 The content covering Ericsson supplying crossbar to the APO and the establishment of the factory at Broadmeadows was pr?cised from "LM Ericsson 100 Years: Volume II" (Attman_&_Olsson_1977) and "Establishing L. M. Ericsson Crossbar Production in Australia" (Spongberg 1967). The content covering the development of cellular mobile systems was pr?cised from "The Ericsson Chronicle: 125 years in Telecommunications" (Meurling & Jeans 2000). Attman, A; Olsson, U. 1977. "LM Ericsson 100 Years. Volume II: Rescue, Reconstruction, Worldwide Enterprise 1932-1976". (Trans. Green, A; Green, E; Bradfield, K). ?rebro Sweden: Ljungf?retagen, 1977. Meurling, J; Jeans,R. 2000. "The Ericsson Chronicle: 125 years in Telecommunications". Stockholm: Informationsfrlaget. Spongberg, C. A. 1967. ? 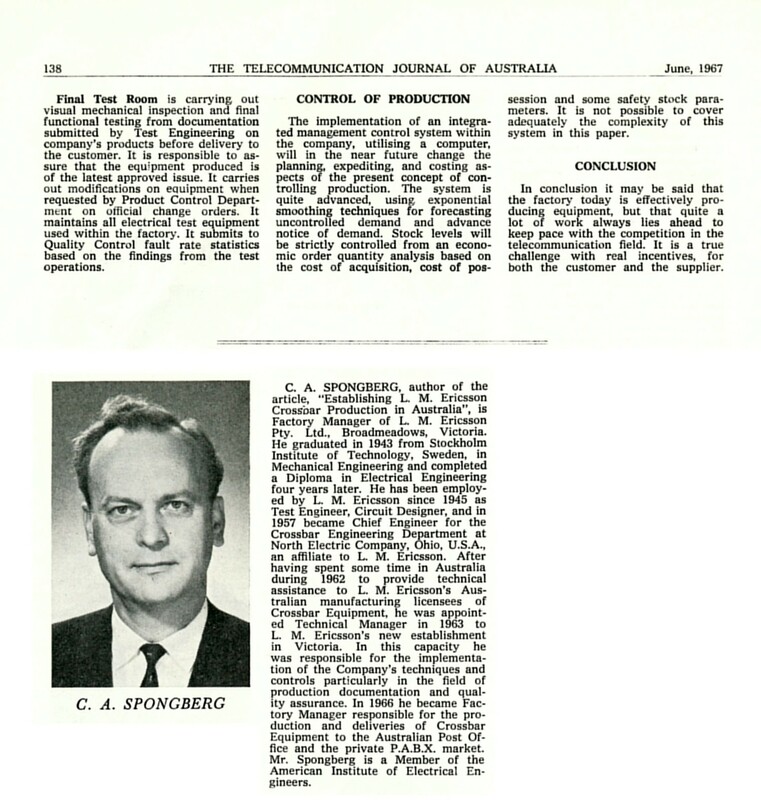 "Establishing L. M. Ericsson Crossbar Production in Australia" Telecommunication Journal of Australia Vol 17, No. 2 June 1967. On 6 December 1963, Ericsson opened a purpose-built factory at Broadmeadows in Victoria to manufacture crossbar switching equipment for the Australian Post Office. The historic paper entitled ?Establishing L M Ericsson Crossbar Production in Australia? (Spongberg 1967) by C. A. Spongberg, who was the factory manager at the time, was published in the June 1967 issue. The paper describes the establishment of the factory and the transfer of Ericsson skills and processes to ensure proper quality assurance and documentation. Broadmeadows was used continuously for the production and distribution of telecommunications equipment from 1963 until 2007. It comprised a cosmopolitan workforce of some 3,o00 employees at its peak, and the multi-cultural aspect was typical of the manufacturing sector in Australia after the Second World War. Broadmeadows was a state of the art manufacturing site that fabricated most of the crossbar exchanges, AXE exchanges, PABXs, queuing systems, network terminating units and, in later years, even mobile phones. 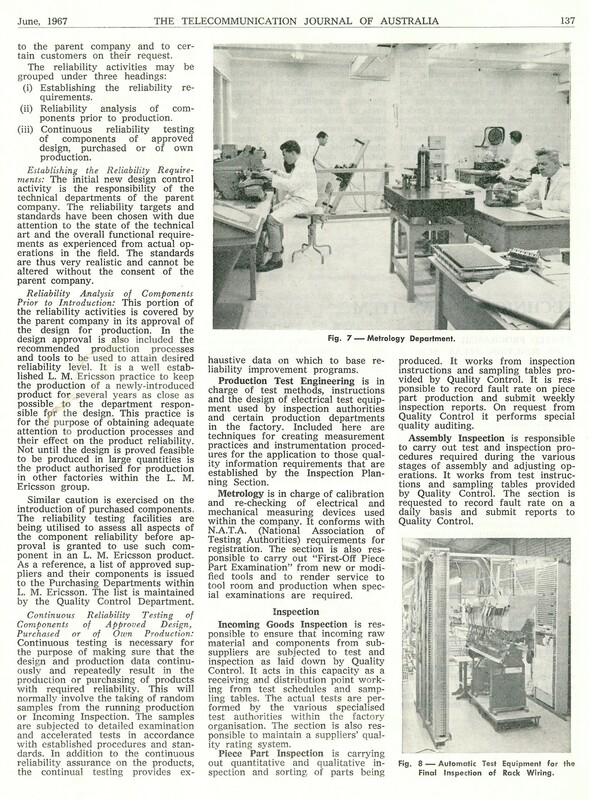 The scope of these manufacturing activities incorporated or spanned the range of design, testing, metal fabrication, metal plating, painting, component testing, printed circuit board manufacturing, board and system assembly, wire manufacture, transformer winding, capacitor manufacturing and system testing. The factory was at the forefront of adapting automated control and industrial robots for activities such as high-speed ?pick and place? for circuit board assembly. (One automated production plant was commissioned in 1990 by the then Prime Minister R. J. Hawke.) This technology later transitioned to undertake surface mount assembly for AMPS and GSM transceivers. Broadmeadows was also the centre for the repair and refurbishment of Ericsson mobile phones, before amalgamation with Sony. Local manufacturing began to wind down from 1998 and production shifted over the next three years to off-shore contract manufacturing facilities. Distribution continued from Broadmeadows until the end of 2007 when the factory was completely closed and the administration and models were relocated to Docklands and Port Melbourne.